This month I have returned to the Carperby Community First Responder (CFR) team after a 10-week break. Our team owes a big thank you to David Brampton who remained on call for days on end in February when others were not available. We would love some more to join us…. I wrote this article for the Upper Wensleydale Newsletter to explain why community first responders are so needed. 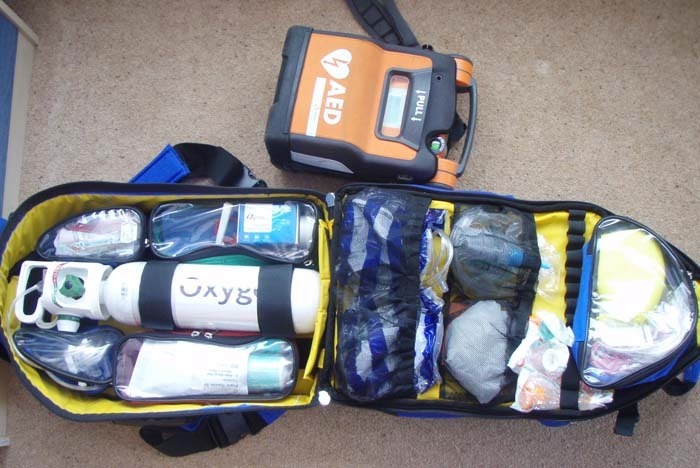 Above: our first responder kit complete with defibrillator and oxygen. I’ve been a community first responder for 13 years and I have never been so aware of the need for more volunteers especially in mid Wensleydale. I’ve never had many “shouts” since joining the Carperby CFR team but when I have been sent by the ambulance service to a patient I have always been surprised at how useful someone like myself can be. The only training I’ve ever had has been with the Ambulance service. Since July 2006 that has been with the Yorkshire Ambulance Service (YAS) which ensures we have the skills and knowledge to deliver emergency first aid and resuscitation until the arrival of a health care professional. Sadly these days we often have to wait longer for an ambulance to arrive because slowly but surely the hospital facilities we require in our rural area have been moved further and further away from us. This means that the ambulance based at Bainbridge can be out on a shout for five hours or more if a patient needs to be taken to the James Cook University Hospital in Middlesbrough. While it is unavailable, ambulances have to be sent from Richmond, Northallerton, Harrogate, Pately Bridge or even further away. As I found last year, for a patient living on their own the arrival of a first responder can be a great relief. A first responder can also take care of those little but oh so important jobs such as finding a neighbour to lock up the patient’s house and to make sure that their family knows what has happened. One of our team members has also sorted out care for pets while their owners were in hospital. Last year I had a shout to assist a young couple parked in a layby somewhere between Aysgarth and Worton. They had started their journey in high spirits looking forward to a long walk up on the moors above Hawes. But then the man was struck down with severe chest pains. I found them and gave oxygen therapy to the 25-years-old man until the ambulance arrived. He was then taken to hospital. But what about his partner? She didn’t know the area and was in no fit state to drive to Middlesbrough. On another occasion I was asked to attend even though the ambulance would arrive before me probably because the spouse of the patient needed help. It is fulfilling serving our community in this way and I would encourage more to join us. Every little bit helps even if you can only be available a few days of each month. The training course generally takes around 19 hours and may be held either in the evenings or at weekends. It includes how to use the automated external defibrillator and give cardio-pulmonary resuscitation (CPR) and oxygen therapy, as well as an understanding of the various medical conditions one might encounter. We also have regular practical training sessions and six-monthly assessments with a very helpful and supportive Community Defibrillation Trainer.